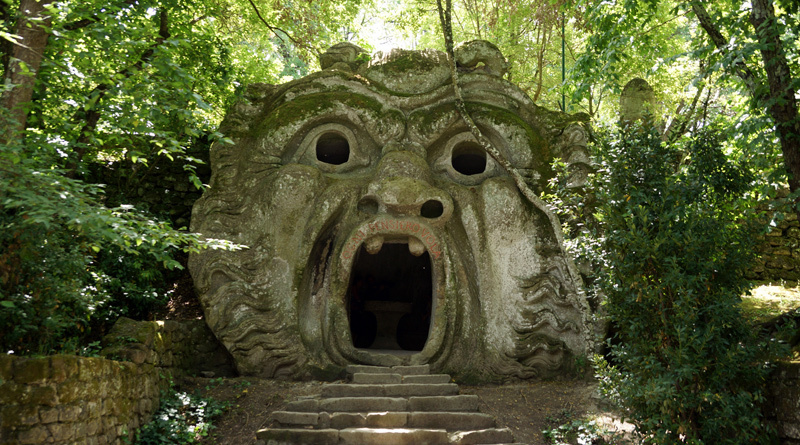 The history of the Sacred Grove of Bomarzo, more commonly known as the Park of the Monsters, starts like a romantic and melancholic tale that could have been the inspiration for Madame de Villeneuve’s 1740 novel Beauty and the Beast. Once upon a time, an Italian Renaissance prince, passionately in love with his wife, decided to have a marvelous garden built in her honor. 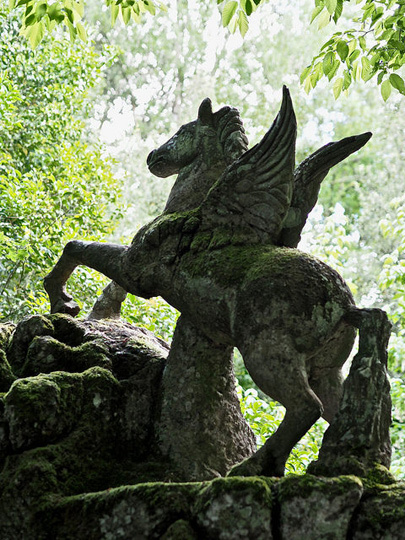 Pegasus fountain. 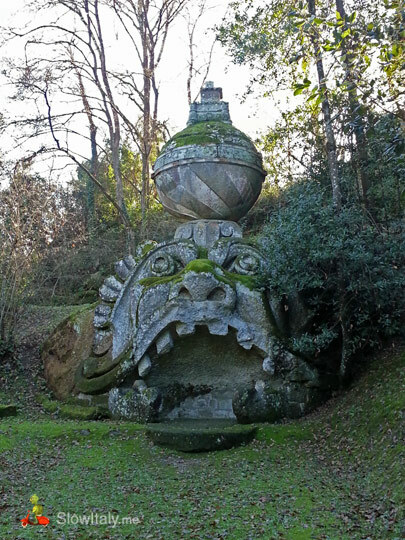 Bomarzo Park of the Monsters. Photo by Carolyn Whitson. 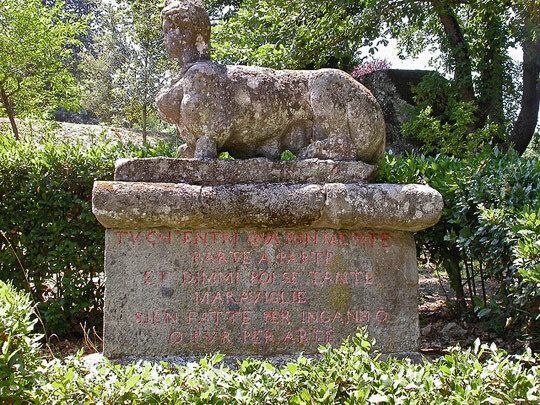 The prince who had the park commissioned was the condotierro Vicino Orsini, a patron of arts and amateur scholar, who had inherited the local Duchy of Bomarzo from his father. 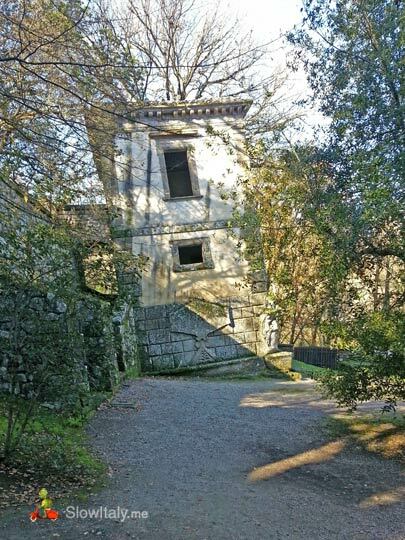 In 1552, from a wild ground with shapeless rocks of peperino stone, he created a magical and enchanting place, just outside the little medieval town of Bomarzo (province of Viterbo), in the hills of the Lazio region. Ogre’s mouth. Orcus was a god of the underworld in Roman mythology. 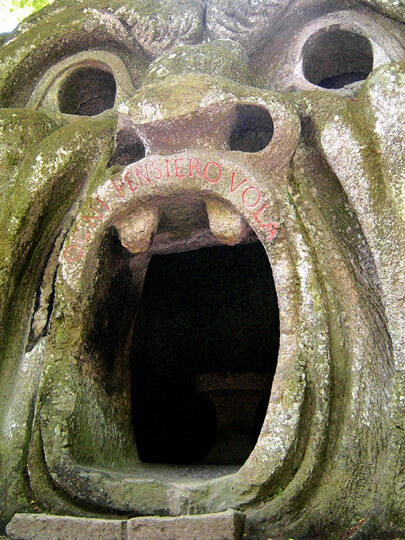 The hellish component of the character is amplified by the duality of the cave; as it is a dining room inside, one can both eat inside and be eaten by it. Photo © Slow Italy. The works were undertaken by Pirro Ligorio, the same architect who built the Villa d’Este of Tivoli and finished Saint Peters Basilica upon Michelangelo’s death. 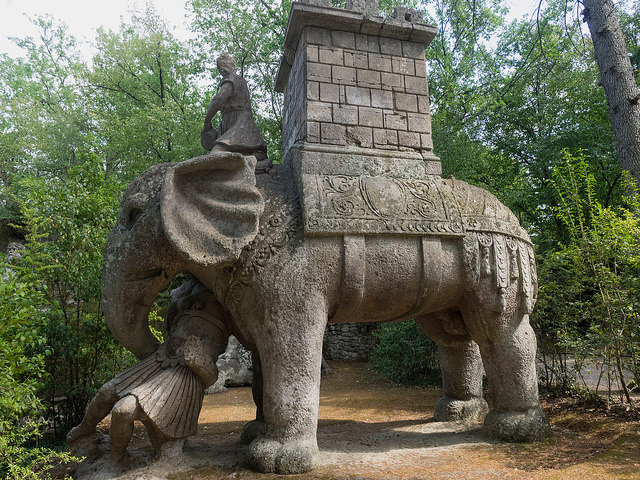 An elephant of Hannibal strangling a Roman soldier. 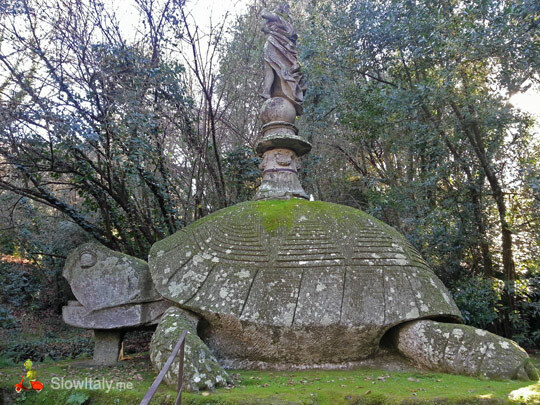 Tortoise with on top a woman standing on a sphere, symbolizing a winged victory. 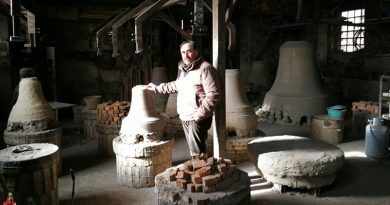 Peperino stone used for the sculptures is a grey-brown tuff of volcanic origin that can be easily cut, but not finely worked, which explains why the statues are poorly sculptured. The Sacred Grove (“sacred” is used here in the sense of “marvelous”) is truly an artistic and cultural unicum in the world. 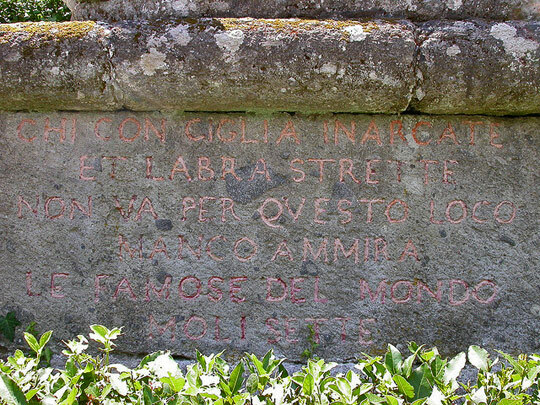 As one of the inscriptions says: sol se stesso e null’altro somiglia. The huge stone monsters, seemingly with no connection to each other, seem to have been scattered there almost randomly. 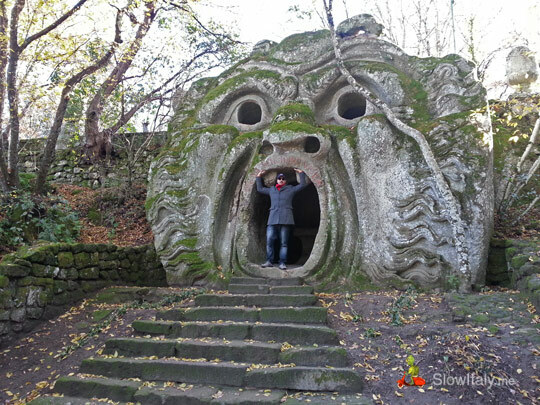 The park is not like any other typical Italian garden that you visit merely for the pleasure of admiring the various botanical species and geometrical forms. The Sacred Grove is more like a ‘garden-book’ or ‘book in stone’ as the art historian John-Paul Stonard and the Argentinean writer Manuel Mujica Lainez described it respectively. 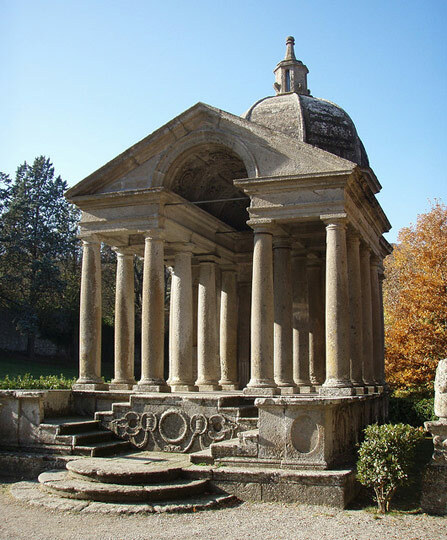 A place that you can only truly appreciate if you also have some insight into the works of Dante, Ariosto, Petrarch, Bitussi, Francesco Colonna and Bernardo Tasso. Dragon attacked by lions. 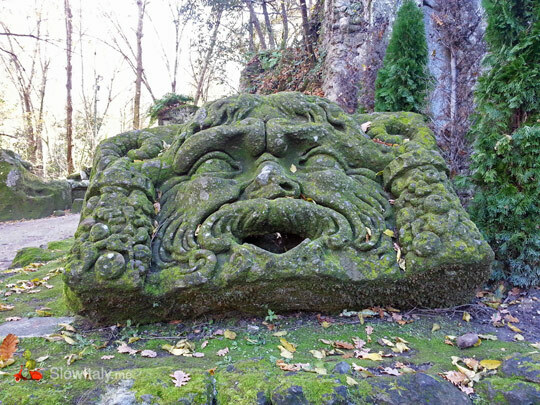 Bomarzo Park of the Monsters. 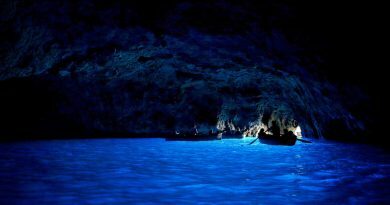 Photo by Andrea Marutti. 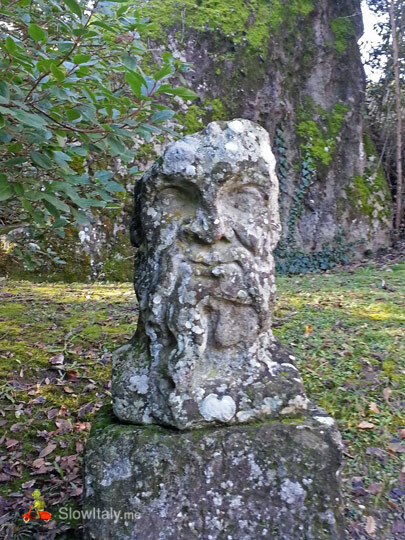 Vicino Orsini was very close to the Farnese family and befriended with most of the famous literary men of his time like Bernardo Tasso, Bitussi and Annibal Caro, as proven by the many inscriptions and literary references throughout the garden, some of which are now eroded. Some scenes depicted in the garden may evoke episodes of baroque works like the Poliphilo’s Strife of Love in a Dream (Hypnerotomachia Poliphili) by Francesco Colonna, Il Canzoniere by Petrarch or the epic poem Amadagi by Bernardo Tasso (later published as Floridante), or even the romance epic Orlando Furioso by Ludovico Ariosto. 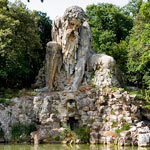 Some scholars think that the giants Nimrod and Ephialtes of Dante’s Inferno may have been modeled after the statues of Neptun and Hercules in the Sacred Grove. However, no consensus has been reached among historians for a common and definite explanation for the entire garden. 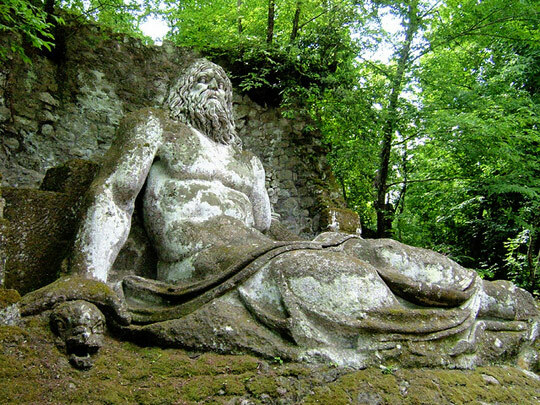 Neptun symbolizing the Tiber flowing down to the valley occupied by the Tyrrhenians from Lydia when they arrived in Etruria. The dolphin symbolizes Apollo. 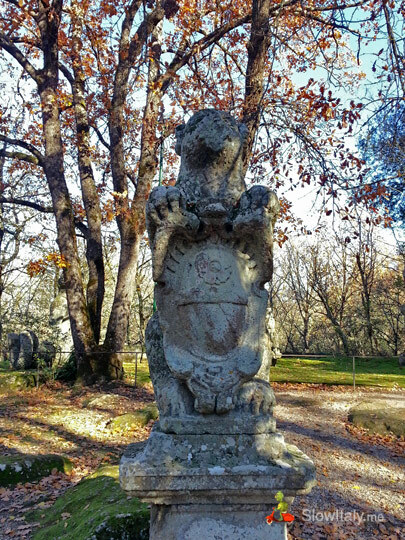 On the outside of the leaning house Orsini's coat of arms and motto are engraved "quiescendo animus fit prudentior Ergo"
An inscription on the pedestal of one of the sphinxes at the entrance of the park warns the visitor: Chi con ciglia inarcate/et labbra strette/non va per questo loco/manco ammira/le famose del mondo/moli sette (He who does not go there with eyes wide open and lips sealed will not be able to admire the most wonderful marvels). Many interpretations have been advanced trying to explain the meaning behind the lay-out, characters and design of the park. 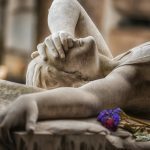 Legend has it that the prince had the garden built upon the death of his wife, as a kind of enigmatic and romantic poem to his lost love. However, the plans and execution pre-date the loss of his wife. Vicino Orsini married Giulia Farnese, a cousin of Cardinal Alessandro Farnese, in 1544. His wife died in 1560. 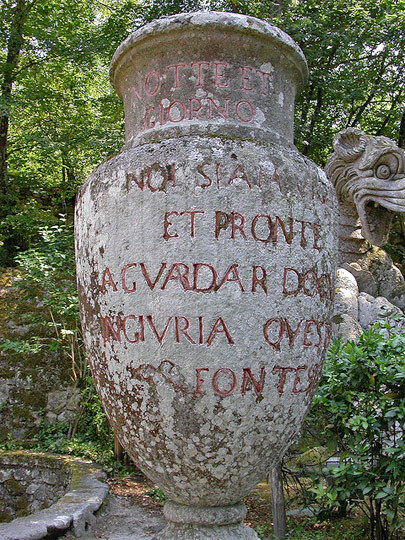 Some sources even state that it was not Vicino, but his father Giancorrado Orsini who first came up with the idea of the Sacred Grove. 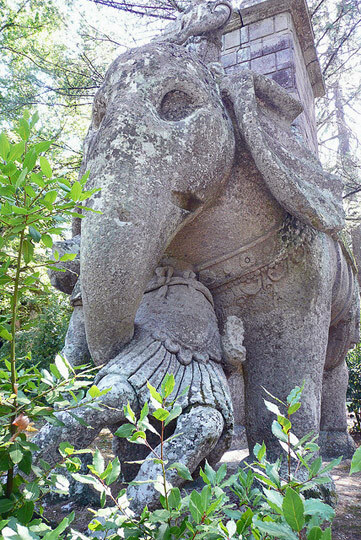 What is true is that the prince had a Temple built inside the garden as a memorial to his wife. 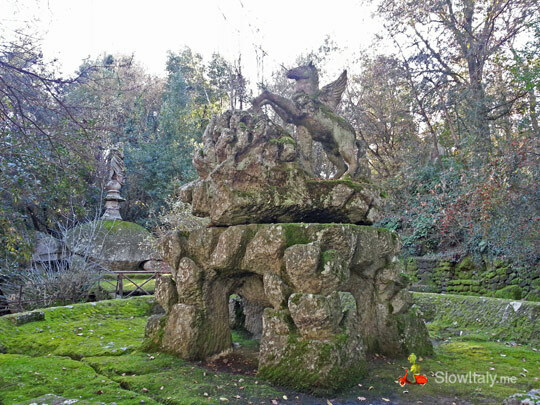 According to the Argentinean writer Manuel Mujica Lainez and others, the garden may be some kind of inner portrait of Vicino Orsini, celebrating the prince’s chivalric view of the world, in a way that was deliberately left enigmatic. 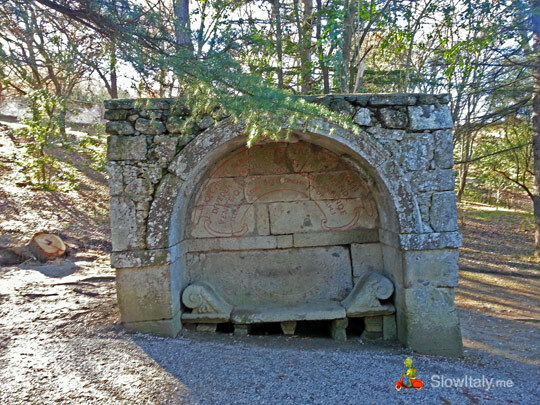 The prince fought as condottiere for the Papal State and his powerful noble Roman family also produced statesmen and churchmen, including a pope, so the garden may have been a way of glorifying the Orsini family using references to their heraldic symbols. Most likely, the garden to which Vicino Orsini dedicated his life was almost unknown to his contemporaries, apart from his literary friends. 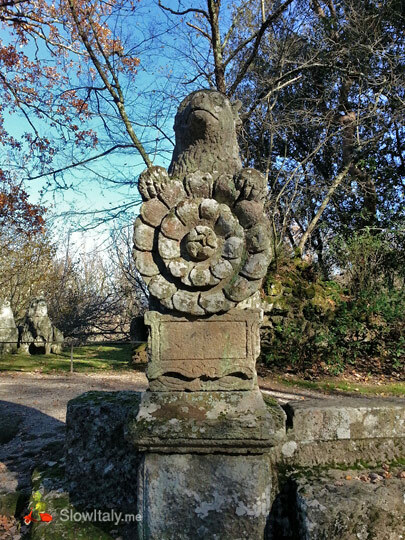 After his death, the park fell into decay until it was rediscovered and restored four hundred years later by the Bettini family to whom the garden still belongs today. 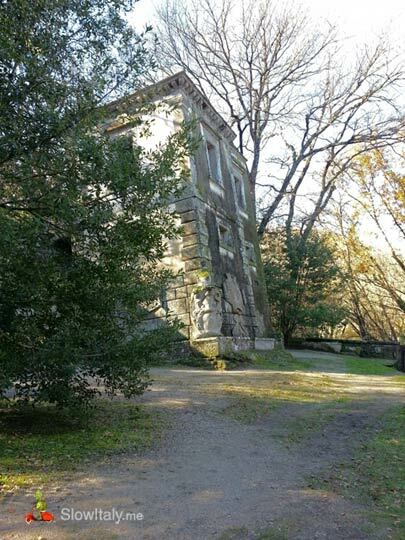 The Bettini family acquired the park in 1870, but it was not until 1954 that Giovani Bettini and his wife Tina Severi started the restoration of the garden to bring it back to its former glory. 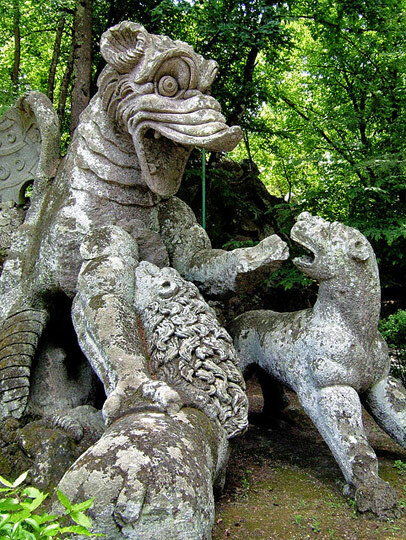 It was then, when the park was rediscovered by the local population, that it was rebaptised “Park of the monsters“. Salvador Dalí visited the park in 1938. It is believed that the inspiration for his 1946 painting The Temptation of Saint Anthony came from his visit to the park. 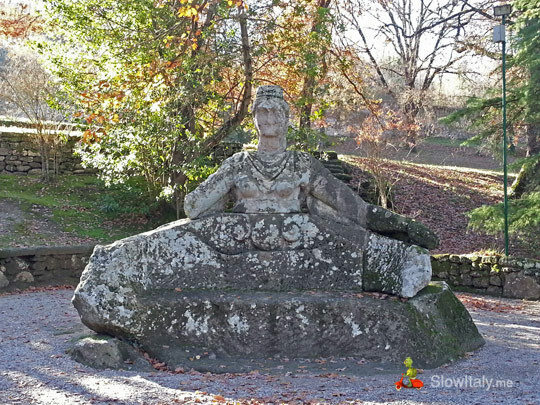 Niki de Saint Phalle was also inspired by the Bomarzo park for her Tarot Garden (Giardino dei Tarocchi) in Pescia Fiorentina (province of Grosseto), Tuscany. Photo credits (from top to bottom): Featured photo by Aaron Fellmeth Photography; ogre © Slow Italy; ogre mouth by Andrea Marutti; elephant © Slow Italy; elephant detail by workflo; tortoise © Slow Italy; pegasus © Slow Italy; dragon by Andrea Marutti; amphora by fluido & franz; etruscan bench © Slow Italy; Neptun by Andrea Marutti; sphinx inscription by fluido & franz; temple by Basil & Tracy; sphinx by fluido & franz; Proserpine © Slow Italy; Proteus-Glauco © Slow Italy.